This is a unique cookbook. It contains recipes with ingredients I’ve never heard of, a layout different from most cookbooks, and a collection of stunning nature photography. The book format is large, 10 ¼ x 11 ¾, and the page layout is uncluttered with beautiful mouth-watering photographs of the dishes represented. The photos are not labelled though, and I would have liked to identify the places, flowers, plants and foods they depict. The recipes are presented according to the seasons, starting with spring and ending with winter. For example, under each season heading you will find appetizers, main courses and desserts made from ingredients popular and available in that season. There are 40 recipes in total: 13 appetizers, 17 main courses and 10 desserts. Each recipe is accompanied by an introductory paragraph and ends with a selection of wine best suited for that dish. The book begins with an introduction to Finland. I learned interesting facts about this country, among them that it contains one of the world’s largest archipelago and that almost every family has a sauna. It is a country close to the North Pole and much of the recipes reflect foods found from hunting in its forests, fishing in its lakes or known locally to the Finns. 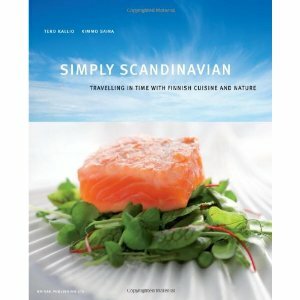 The author chose Simply Scandinavian as a title for this cookbook because the recipes are uncomplicated and require only a few basic ingredients. The problem I encountered as I read each recipe is that sometimes I had no clue what the basic ingredients were or I could not find them at my local grocery store or food market, such as reindeer, nettle, birch sap, false morel (mushroom), mallard, smoked vendace, sal ammoniac, beestings, cep (mushroom), cloudberries, viili, lingonberries, blini, etc. Although I find this book is not practical for me and my family, it is clear that care has been taken to produce a quality cookbook with traditional and modern Scandinavian gourmet recipes. This book would make an excellent addition to the repertoire of any chef or amateur gourmet cook. I will attempt to adapt some of the recipes because I have no doubt they are delicious. And perhaps if I find the missing ingredients at a specialty shop, I will have the pleasure of tasting Scandinavian cooking. Disclosure: Thanks to Katelynn Knutson from Greenleaf Book Group LLC for sending me this book for review. I was not compensated in any other way, nor told how to rate or review this product. Those ingredients are all new to me too. Hmmm...different but definitely one that I would look into! Yummy!